I was a bit surprised to see fanfiction being sold on Amazon – particularly being promoted to me (however unwittingly) by Amazon. Before I go any further, I’ll say that I’ve read a fair amount of fanfiction in my time, and there’s plenty of brilliant, professional-quality work out there. I don’t want anything I write in this post to come across as a criticism of fanfiction, or fan writers, at all. Sadly, this novel leaves quite a lot to be desired. And, if you take a peek inside, you can instantly see that the writing (and story-telling) leaves a fair amount to be desired. I’m going to go through the first few pages and break down the various problems with the prose … and then give a suggested new version. I’m a little hesitant about doing this, because I don’t want to pick on any author, at any level – but I feel that if a book is up for sale on Amazon, then it’s fair game for feedback. Also, I’m not too keen on seeing fanfiction being sold for profit in this way (though I’m all for non-profit fanfiction). On a positive note, I like the dialogue here. It’s brief and snappy, and seems in character (“I think it’s time to go” from Hermione and “Mate…your wand?” from Ron, who’s named in the next sentence). But … there are already some issues emerging. Chapter Title: Although it’s a minor thing, the title “The Black Lake,” followed by “Prologue”, followed by “The Black Lake” again seems overkill. The very first words of your novel are vital (even if the ones that consist of chapter titles or scene-setting). Distractingly Weird Phrasing: “This sudden exchange of human flesh to fabric” makes it sound like someone’s flesh has turned into fabric (not necessarily an impossibility in the Harry Potter world)! I instantly have the impression that the author is trying too hard to be “literary”. Awkward Use of Pronouns: “his fingers muscles relaxed to drop Harry’s newly repaired wand” – this would sound better as “his” wand. Also, you can take it as a given that the reader knows how things are dropped – “his finger muscles relaxed” is unnecessary. Slightly too Many Adjectives and Adverbs: “Harry’s newly repaired wand” “dully clatter”, “pebbled bank”. I’m okay with “newly repaired”, which seems to add useful information, and “pebbled”; I’m not convinced that “dully clatter” is necessary. (I’ll come onto more instances of too many adjectives in the next few paragraphs.) Again, the impression I get is of an author trying a bit too hard. Poor Dialogue Tag: “Harry croaked weakly in reply.” I think “croaked” is too unusual and possibly even slightly unintentionally comic. I’d also cut “in reply” – it’s clear that he’s answering Hermione. Use of “The X” instead of Character Name: Here, Ron is described as “the teenager”. This sounds awkward because we’re in Harry’s viewpoint, and Harry presumably thinks of Ron as “Ron”. The author is trying to avoid repeating “Ron” too often – but character names are one of the few things you can and should repeat; don’t keep stretching for odd variations. I often see “the man” or “the woman” used in this way, and (assuming the viewpoint character knows the person’s name), it invariably feels clunky. 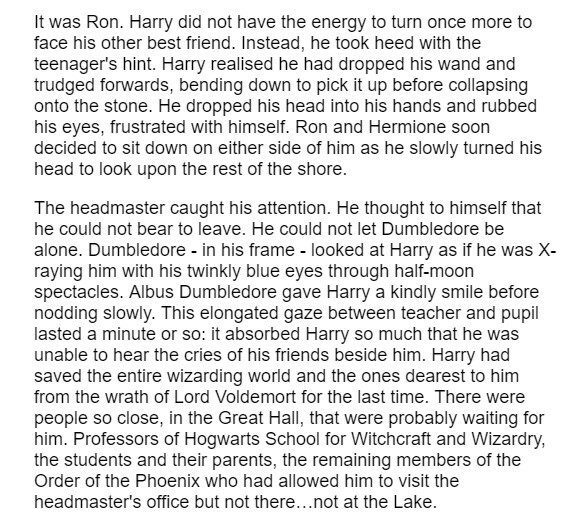 Wavering Point of View: This passage is in Harry’s head (third person limited), but with “Ron and Hermione soon decided”, we seem to have slipped a little into their thoughts. Yes, Harry could assume that they’ve “decided” (rather than, say, sat down without even thinking about it). It’d be better, though, to simply write: “Ron and Hermione sat down either side of him”. Too Many Adjectives and Adverbs (again): In the space of three lines, we get: twinkly blue eyes … half-moon spectacles … kindly smile … nodding slowly … elongated gaze. It sounds awkward and overdone. Weird Characterisation: Why are Ron and Hermione giving “cries” here? To bring Harry out of this odd stupor? We’ve had no sense of impending danger, so does it even matter if Harry has zoned out for a moment? Excessively Long Paragraph: This paragraph is way too long. I couldn’t even fit it all on my screen to get it in one screenshot. There is, quite honestly, absolutely no reason to have a paragraph this long in anything other than experimental literary fiction (think James Joyce). This paragraph could easily be broken up – and it would be far more readable as a result. Too Much Exposition: I realise the author is trying to help us catch up on what’s happened, and a reminder is good, but this slows down the story to a glacial pace. Yes, I realise Harry is imagining what awaits him when he goes back to the Great Hall – but this could all be got across far more succinctly. Overly Formal Phrasing: Phrases like “Finally, it was definite that” sound strangely formal – as though this is a business report rather than a novel. Strange Authorial Voice: These sentences read particularly oddly, to me: “All the attention that was waiting for him in the school would send most people wild with glory and pride, making them feel like the greatest person in the whole world. This would be in any kind of situation apart from the one that had happened on May the second, nineteen ninety eight.” They don’t feel right for Harry’s point of view – the sentiments are, perhaps, but not the way they are phrased. The spelling out of the date is also odd: “May 2nd, 1998” would be fine here. Inconsistent Punctuation: “Headmaster” is correct; “head-master” is not. Even if the author is keen to use the form “head-master”, it should be used consistently. Sentence cut off: “a hint of sympathy in his eyes as he” – as he what? This suggests the book is really in need of an editor; a glance at the same work on fanfiction.net shows that it’s been basically copied onto Amazon verbatim. The author has written a whole book, which is more than many writers ever manage. Frankly, I think a written book – whatever the quality, and whatever stage of the drafting process it’s at – trumps an unwritten book any day! There are some good insights into Harry’s thoughts. Of course he’ll want to be with Ginny, after a year apart. It makes sense he’s torn between saying goodbye to Dumbledore and returning to Ginny. And it’s understandable (and an echo, I think, of his Triwizard tournament challenge) that he is not at all relishing the idea of facing an adoring crowd right now. Here’s how I’d rewrite it. I’ve tried to preserve everything that happens so my edits are primarily changes to sentences and phrases, plus a number of cuts to remove extraneous details. I wouldn’t say this is perfect – but hopefully you’ll agree with me that it’s an improvement! Harry Potter, who’d been mulling over the night’s events, stirred at a tap to his shoulder. His wand dropped from his fingers and clattered down the pebble bank of the shore. When he turned, he saw Hermione. 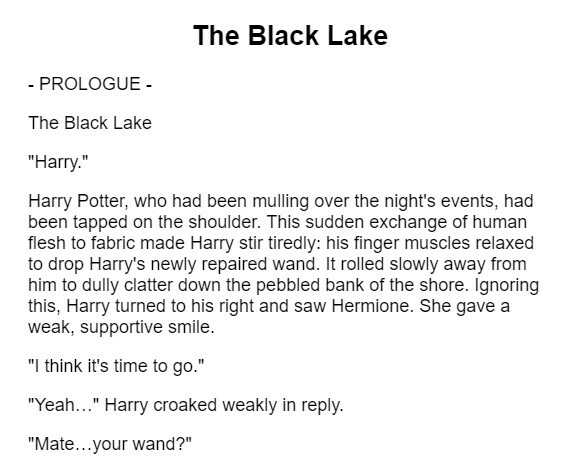 Harry trudged down the bank, picking up his wand before collapsing onto the ground and dropping his head into his hands. Ron and Hermione sat down either side of him as he looked slowly out at the shore. Dumbledore caught his gaze … and now Harry couldn’t bear to leave. He couldn’t let Dumbledore be alone. Dumbledore – in his frame – gazed intently at Harry, then gave a kindly smile before nodding slowly. Absorbed by his gaze, Harry was unaware, for a moment, of Ron and Hermione either side of him. He had saved the wizarding world – and the people dearest to him – from Lord Voldemort for the last time. Right now, the Great Hall would be full of people waiting for him: his teachers, fellow students and their parents, the remaining members of the Order of the Phoenix. But here, at the lake, everything was quiet and still. In the Hall, they’d be waiting to celebrate. Healers would already be tending to the injured; Ministry of Magic officials would have come from London to arrest the surviving followers of Voldemort. Everyone would want to congratulate him, to thank him. There’d be journalists, too; Daily Prophet reporters eager for the first interview, the first photograph. Perhaps the idea of fame and attention would fill most seventeen-year-olds with excitement. But not Harry. Not after everything that had happened. All he cared about was saying his final goodbye to Dumbledore … and seeing Ginny. She’d be waiting for him, too. He was desperate to see her properly for the first time in nearly a year. He wanted to hold her. Kiss her. Listen to her. But right now, Dumbledore was more important. Dumbledore, who was still smiling, gently, as though he knew what’d been going through Harry’s mind. Harry picked up his wand and held it tight. He pushed himself onto his feet and limped towards the portrait. When he was face-to-face with it, Dumbledore’s smile faded and his expression became more serious. As I said above, I’m impressed by anyone who’s finished a novel. This one comes across as a first draft in need of a fairly thorough rewrite – and there’s no shame in that. If you’ve got a draft at a similar stage, look out for some of the errors I’ve mentioned (too many adjectives, awkward phrasings, viewpoint slips) … and if you’re planning to self-publish, get an editor or at least a beta-reader to go through the manuscript thoroughly first! Do you have a particular bugbear when it comes to writing style? Is there an error or stylistic twitch that has you putting a book down instantly – or hurling it across the room? Share your thoughts in the comments below. 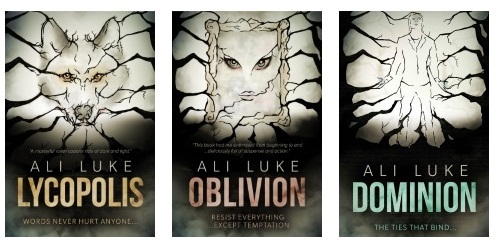 I share your concerns about for-profit fic (except for the LJ Smith issue which is a murky case and is a warning to authors about contracts and ownership of work, and filed-off-the-serial-numbers works which usually take enough rewriting to justify their sale). I wanted to nope/back-button out at “elongated gaze”! Excessive descriptions and too many odd choices that throw the reader out of the world rather than draw them in. I think you make a lot of good points and by using concrete examples like this you show how to avoid these pitfalls instead of vague advice like “don’t overdo descriptions”. This is a really informative post, thank you. An editor is out of my non-existent price range but a good beta reader is worth their weight in gold if you can get one. Thanks! Like you, I’m okay with filing-off-the-serial-numbers: partly, as you say, because the author has done a lot of work to make characters their own (often in a setting that’s AU compared with the original) … and also because they’re not piggy-backing sales on an established brand. Thank you for the post. My pet peve is when an author changes a character. For example when a strong and skilled warrior is captured by unskilled combatants in a fight that the warrior would be expected to easily win. That IS annoying! Characters shouldn’t be pushed into acting weakly or stupidly for the sake of the plot: there’s (in my experience, at least!) always some way to (a) keep them true to their characters while (b) moving the plot in the right direction. I’m pretty picky about what I read. I’ll instantly put down an ebook if I find its/it’s, they’re/their or similar used incorrectly in the first few pages (though no one’s perfect, and I might forgive one such error in the whole book if the author seems to otherwise know what he/she’s doing). More stylistically, it bugs me when the author starts out by spending too much time in the character’s head, spelling out her every thought and emotion in detail that makes me cringe. I think it’s an internal form of overexplaining. (He reached out his arm, opened his fingers, inverted his hand, closed his fingers around the door handle, tightened his grip, turned the handle and pulled the door towards himself. – Just say “He opened the door”!) I tend to see the internal version of this a lot in writing that’s not ready to go out into the world. It makes me cringe, like when a stranger comes up to you and starts giving you all the unpleasant details of his marital problems and how they make him doubt his worth as a man. Slow down. I don’t know you yet! I agree: like you, I’m picky about grammar — but also, a lot of basic mistakes like that tend to go hand-in-hand with more major story issues (like poor pacing or one-dimensional characters). Good point about too many internal details. I tend to find my first drafts have rather a lot of those that need cutting out! Some literary novels can do slow-paced introspection well, but I don’t think it’s generally a good idea in more commercial works. This post of yours was certainly interesting. Reading writing like that (in the fan fiction) is painful, and I enjoyed your critique. I too am surprised that Amazon has this book out there for purchase. I wonder about copyright issues or trademark violation that could easily motivate Rowling to take the author to court. Fan fiction is one thing, but to publish it is quite a bold and perhaps foolhardy move. I really enjoyed the Disney movie Tomorrowland, in spite of its flaws that many have pointed out. I came across fan fiction novel, 300 pages, in the Internet. This novel brought out a lot of the unrealized potential of the movie. In fact, it was better than the movie and a very well-written novel. I wound up interacting with the author via email a couple times. Thanks for your critique. Fascinating. I trust that Kitty and Nick and of course Paul too are doing well, Even though I am not active in Huddle currently, I do faithfully follow your postings both from Huddle and Aliventures. 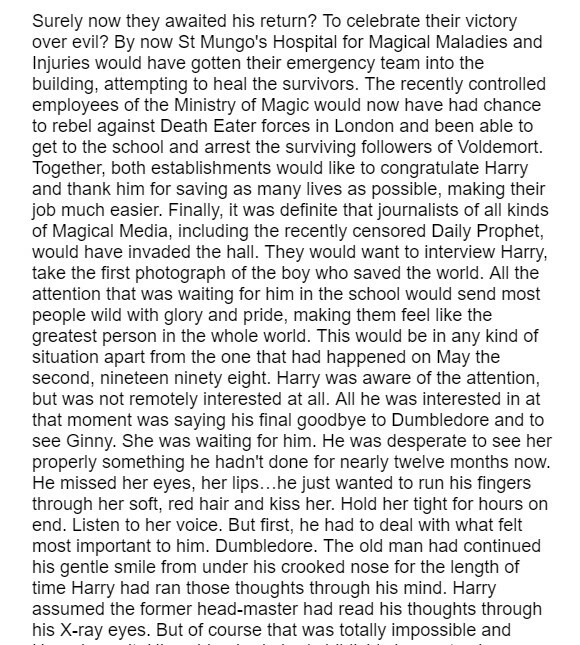 I suppose, from Rowling’s perspective, this piece of dodgy fan fiction is a tiny drop in the ocean..! All’s well (though busy as ever!) here. In Writers’ Huddle, I’ve got an interview lined up soon with non-fiction author Ed Cyzweski: if you’ve not come across him before, I think you might enjoy his work (he writes about Christianity, writing, and the places where the two intersect). His website is here: https://edcyzewski.com if you want to take a look! Excellent post. I love seeing the before and after. I agree with you, it feels like a first draft. Fan fiction is never easy since the fans of a beloved series tend to be overly protective. That’s very true. I’ve always felt that fan fiction is surprisingly difficult: you need to be true to pre-existing characters, and know them just as well as you’d know characters you’ve invented. And, as you say, fans are often very protective about “their” characters. I think this author might have got away with some slightly shoddy writing if they’d really nailed the characters, but these excerpts suggest not (and the reviews indicate that’s an issue throughout). Practical and informative post Ali! It comes back to Stephen Kings ‘On Writing’, i.e. ditch 90% of words ending in ly! Great idea to take a piece of prose and show what could be done with it. Great for us that is, time consuming for you, so I appreciate you took the time, thanks! p.s. just chuck another ‘l’ in realy on the sentence “(Especially as “weakly” isn’t realy necessary in the second case. )” then eat this part of the comment obviously lol! $3.67 for this? Also, what about copyright? Anyway. Thanks for a great post, Ali! It was very useful. I try to cut adverbs from my writing though it’s still pretty difficult for me. Also, “Use of “The X” instead of Character Name” reminded me how I used to write brunette, singer, etc, instead of using a name of a character five years ago. Again, thanks for a wonderful post! 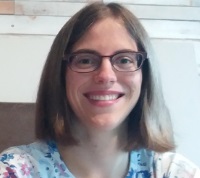 Amy’s last blog post ..Correct Sentence Structure English. Really Helpful Tips! Thanks Amy! Yes, I was quite astonished to see this openly for sale on Amazon. It appears to have been removed now; I guess Amazon are cracking down!